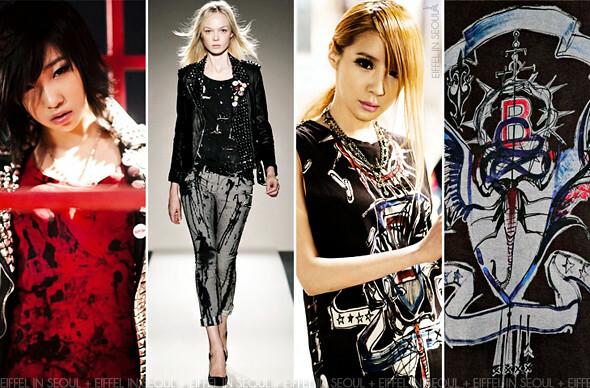 Eiffel In Seoul: 2NE1 wears Balmain in 'Lonely', were they sponsored? 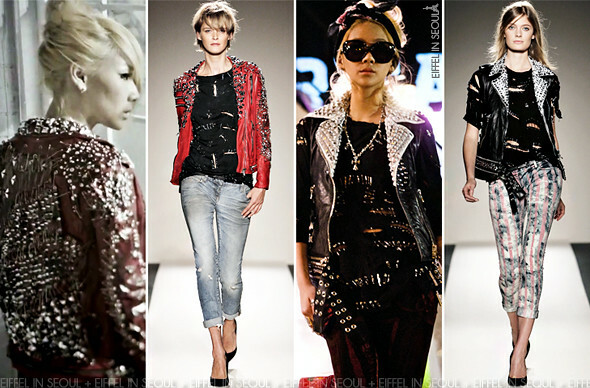 2NE1 wears Balmain in 'Lonely', were they sponsored? Finally.. the last post for 2NE1's latest single, Lonely. It's been a month since the release of the music video but I had to address an issue regarding their outfits.. continue reading till the end. CL (이채린) was the only member dressed in Balmain throughout the music video while other members were in Balenciaga, Burberry Prorsum and Christopher Kane. The first look was the red Balmain leather jacket with safety pins and studs all over, a great opening look. Her second look was slightly interesting with a Balmain scarf over her hair and huge sunnies, reminds me of Lady GaGa. Minzy (공민지)'s hairstyle definitely suits the edgy Balmain look. As previously posted, Park Bom (박봄) was wearing a Balmain cotton t-shirt with Balenciaga skirt. 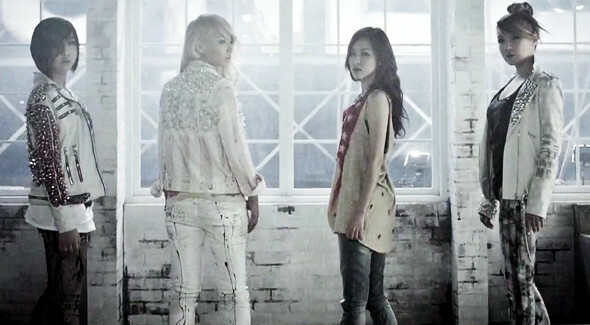 Towards the end of the video, the ladies were all dressed in white Balmain leather jackets with the exception of Sandara Park (박산다라). I won't lie, I was disappointed with how the outfits were styled. Head-to-ankle in Balmain, most outfits were styled exactly like the runway. Everyone can do that, so why hire a stylist? I'm sure most of you have read (Nate/Osen) that the ladies were sponsored by Balmain for the music video. That is absolutely false. Having contacted the people at Balmain, here's what they have to say, "This person is not sponsored by us at all. She must have bought Balmain clothes herself!". Just as I expected, knowing Balmain has a strict policy on loaning their clothes to celebrities who will represent the brand's image. I highly doubt Park Bom (박봄)'s Alexander McQueen dress in 'Don't Cry' was sponsored too. do u hate 2NE1? i dont know why, but it seems like ur trying to make 2NE1 look bad. "Just as I expected, knowing Balmain has a strict policy on loaning their clothes to celebrities who will represent the brand's image." 'just expected' ??? 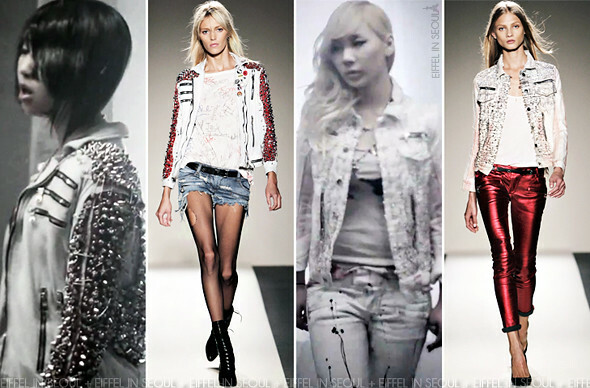 its like ur saying that 2ne1 is not good enough to represent balmain. so what if theyre dressed in balmain head to ankle thorough the video? Some people have always asked me why I constantly write about 2NE1 and not other groups, why I'm focusing on them so much and here.. someone says I hate the group. If you think I'm making them look bad you're taking it the wrong way. I respect the ladies and all they have acheived but I just find it ridiculous for some "representative" to tell the media that they are sponsored when they are obviously not. If Balmain can decline Kanye West's invite to Balmain's fashion show, it doesn't surprise me that 2NE1 are not sponsored by Balmain. But of course sponsoring someone and inviting someone to a fashion show is two completely different story. I did not say 2NE1 was not good enough to represent Balmain and there's absolutely nothing wrong with dressing head to toe/head to ankle in Balmain. I just feel that it was poorly styled and they are capable of so much more. I'm sure the company is wealthy.. http://bit.ly/m0Gp9R. I wouldn't be surprised if they weren't sponsored. They are very popular and talented, but Balmain is a very elite company and would most likely only sponsor celebrities that are world famous, a face that is recognized anywhere... i.e. Beyonce, Rihanna, etc. however, whoever that 'representative' was that said 2NE1 were sponsored was really irresponsible (i seriously hope they weren't a YG rep-- i noticed the article was rather ambiguous about who the 'representative' was representing though). and for nate/osen to publish something without checking their facts... is quite a mark down for me in terms of their credibility as a news portal. According to Nate, 'the total cost of 2NE1’s wardrobe for their “Lonely” music video comes out to about 200 million won (approx $183,800 USD)' and was counted as 'production costs', so i'm pretty sure they bought it. I also wouldn't be surprised if they bought it for personal use... it's not like they don't have the money, haha. Also according to Nate, Bom's dress was 'under possession by McQueen’s family, but after finding out that McQueen had worked with Big Bang and 2NE1 in the past, they accepted Yang Hyun Suk’s request to feature it in Bom’s latest music video.' But I don't know if I should believe this or not..? They bought the clothes themselves, they were not sponsored. That pretty much sums it up! They definitely bought the outfit themselves. Like you said, it's not like they don't have the money. Park Bom's dress was not a one-of-a-kind dress, the particular dress she wore was mass produced and was retailing on Net-A-Porter for USD$11,820 (7,165 GBP), sold out now. I doubt McQueen loan them the original piece. Allkpop was merely translating the article Nate/Osen wrote which was false. Yeah I actually do remember seeing it on Net-A-Porter but I just thought that Bom was given the original piece. Hooray for k-media! ... not. I agree Eiffel In Seoul...I think their stylists missed the mark on this one. Although it doesn't look too bad...its just seems too "matchy matchy" for them. They should've been bolder and more daring like what 2NE1 is known for...most of this seems right off the run way and theres nothing creative about it. 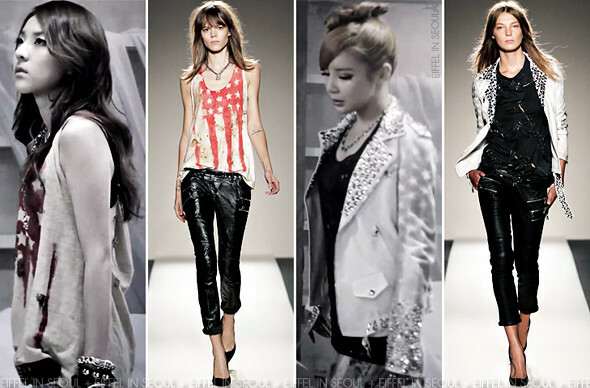 But I like the way Bom's outfits look and CL...this is just her style. Alexander McQueen dress in 'Don't Cry was definitely loaned. There was an article on it. Also, that's the last dress he made that the family still has so I doubt they would sell that. It's up to you to believe whether those reported news are true. Thank You mym012, you spoke what's on my mind. k-media has a tendency to exaggerate the facts. I learned this with Bi Rain. That's what I realized too.